Otosome - No longer one of the cars the Japanese manufacturer will issue the latest variant of its flagship SUV Mitsubishi Outlander 2016 of Mitsubishi's new car was first launched on the actual performances of the New York Auto Show in June, with the aim to enliven the share of the automotive world, especially car manufacturers Japan. Mitsubishi SUV mainstay of this one will also be priced at a lower price than the previous variants. 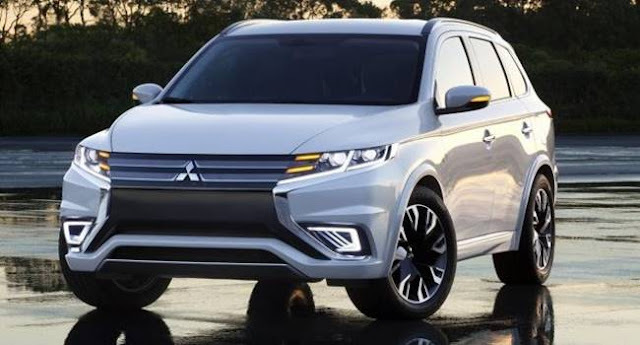 But Mitsubishi's own party also ensure this new product has undergone several improvements and also has a new design models that look more muscular, and will look different to similar variants that already exist in the market. One of the most notable changes from the 2016 Outlander is seen on the side of the fascia. Where on the side of the automaker is equipped also with devices Dynamic Shield combined with twin horizontal chromed grille. The combination is also embedded with a complete model of halogen headlamps and also with LED DRL. Then at the bottom. At the front air intakes given current Outlander knickknacks with a brand-new model of bumper color scheme dimmer. So the impression given on this Mitsubishi car making it look elegant and stylish. Coupled with a combination of chrome strip that has been wrapped on each side of the side. Sporty nuances clearly visible in this car. Coupled with the latest design of Mitsubishi models that make this one product seem more macho and more fresh on his face. Reportedly one car also will carry out operations on the body structure and suspension make it more resilient. Of course it makes the capabilities ready to hit a variety of terrain. The latest upgrade to the physical sector plus the two engine options. The first of the 4-cylinder 2.4-liter that has a power up to 166 hp coupled with a torque of 219 Nm owned. The second 3.0-liter V6 engine that can pump power up to 224 hp coupled with a torque of 291 Nm owned. Two engine options will certainly be powerful enough stock to Mitsubishi Outlander 2016 while deployed to the market. Mitsubishi Outlander Sport is a compact SUV that was launched in 2012 ago. Has undergone a facelift in 2014. The model is released in three variants, namely GLX, GLS, and PX by presenting a choice of six colors.